A top-of-the-line trailer that's easy to get your kids into (and back out again). With seating for 1 or 2 children, it uses bowed side struts to give them both wiggle room. Adjustable suspension and reclining hammock style seats make the ride comfy. 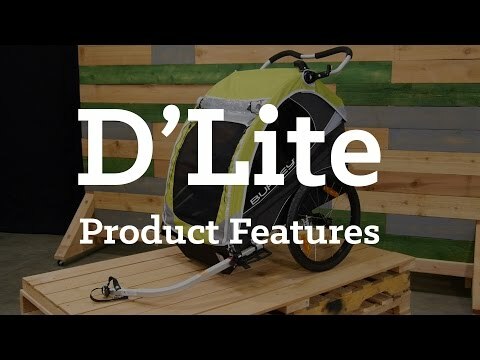 Its adjustable handlebar does double duty as a roll cage (when used as a bike trailer), and the sturdy aluminum frame keeps your passengers protected as you roll along the bike lane. Simple to use, the Padded Spring Integrated Technology ( S.I.T.™) seat prevents tangled straps and is machine washable. Adjustable suspension lets you fine tune the ride. UPF 30 rated tinted windows block more than 96% of harmful UV. Water-resistant cover zips on for protection. Flex connector lets you lie the bike down, while the trailer remains upright. Seat release buckles collapse the seat down for easy conversion from carrying kids to hauling cargo. Wheels are easily removable with a push button quick-release. Adjustable handlebar doubles as a roll cage when being used in trailer mode, handlebar height: 76.2-116.8 cm. Folds for easy storage and transport: 94 x 79.4 x 36.2cm. Open dimensions: 84.5 x 79.4 x 97.2cm. Interior seat width is 57.2cm, shoulder width is 64.8cm. Various adapters available separately to use for walking, running or skiing. Includes: trailer, user’s manual, tow bar with hitch, 2 wheels, 2 wheel guards, and safety flag.